PASADENA, Calif. — The chief scientist for NASA's newest Mars rover mission is heading to Death Valley today (April 30), and SPACE.com is going along for the ride. Caltech's John Grotzinger, project scientist for NASA's huge Curiosity rover, is leading a handful of journalists on a two-day trip to the famous patch of California desert, whose geology and vistas are remarkably Mars-like in some places. The goal is to help reporters get a better idea of the science Curiosity will be doing when it touches down on the Red Planet on the night of Aug. 5. We depart from the Caltech campus here at 8 a.m. local time (11 a.m. EDT; 1500 GMT) today, and should roll into Death Valley about four hours later. Unlike frigid Mars, Death Valley will be hot for the next couple of days; we've been told to bring sunscreen, wide-brim hats and lots of water. The 1-ton rover's main mission is to determine if the Gale Crater area is, or ever was, capable of supporting microbial life. 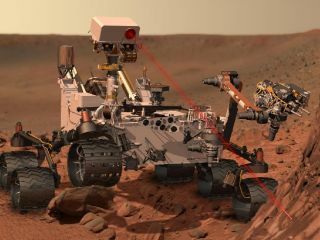 Curiosity will use a suite of 10 science instruments to get at this question, including a rock-zapping laser and gear designed to identify organic compounds — carbon-based molecules that are the building blocks of life as we know it. Some of these instruments sit at the end of Curiosity's five-jointed, 7-foot-long (2.1-meter) robotic arm. The arm also wields a 2-inch (5-centimeter) drill, allowing Curiosity to take samples from deep inside Martian rocks. No previous Red Planet rover has been able to do this. Before Curiosity can begin its science work, however, it must land safely — not a given for any planetary mission, and certainly not for MSL, whose huge bulk necessitated the invention of an entirely new landing method. Curiosity will be lowered to the Martian surface on cables by a rocket-powered skycrane, with cameras rolling all the while.